Trail of Fire Chile Powder Set | Nomad Spice Co.
Want to experience the many varieties of chili powders? Look no further. 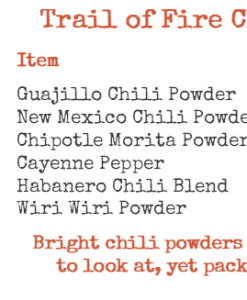 Our Trail of Fire Collection is wild ride of chili powders with unique tastes and heat profiles. 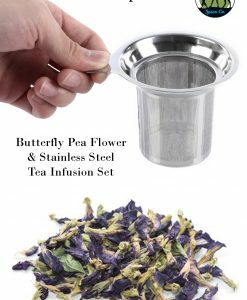 Get this Fantastic Spice Set Now & Save! authentic Mexican cooking. With a fruitier flavor than many other peppers of its kind, this variety adds a tangy, berry-like punch to its spicy repertoire. Our New Mexico Chile Powder comes from arguably the most famous chili growing town in the world, Hatch, New Mexico. The New Mexico chili has a thin flesh and an earthy chili flavor with notes of wild cherries. 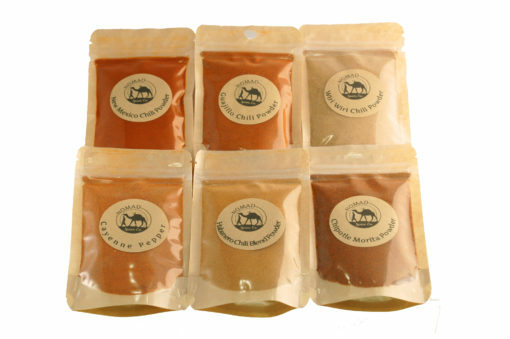 Chipotle Morita Chile Powder is a rich, deep red powder that has all the smoky heat of whole chipotle peppers, but is easier to use in cooking. Cayenne Pepper is popular across the globe for its intense heat and clean flavor. It not only adds kick to a dish, but is a first-rate overall flavor enhancer. Habanero Chile Powder Blend is a fruity mix that makes these chiles a wonderful way to spark up a dish. Our Habanero Powder Blend is made from ground whole Habanero Chiles with the addition of Chiles de Arbol and white pepper. Be very very weary of Wiri Wiri! The Wiri Wiri Pepper is incredibly hot, with a level just under the Habanero and is a staple in Guyana. Habanero Blend – De arbol powder, pure habanero powder, ground white peppercorns.